We have an over abundance of cherry tomatoes in our garden. I’m not complaining. No way. I never plant this recipe but it turned so good and simple. I made this on Sunday and it didn’t last 24 hours in our house. They were perfect last night, creamy and slightly caramelized, but I’d say they were equal or much better in the morning, because, I really, really enjoyed eating them for breakfast, very simply arranged on some toast, drizzled with a little olive oil and sprinkled with parsley. 2. 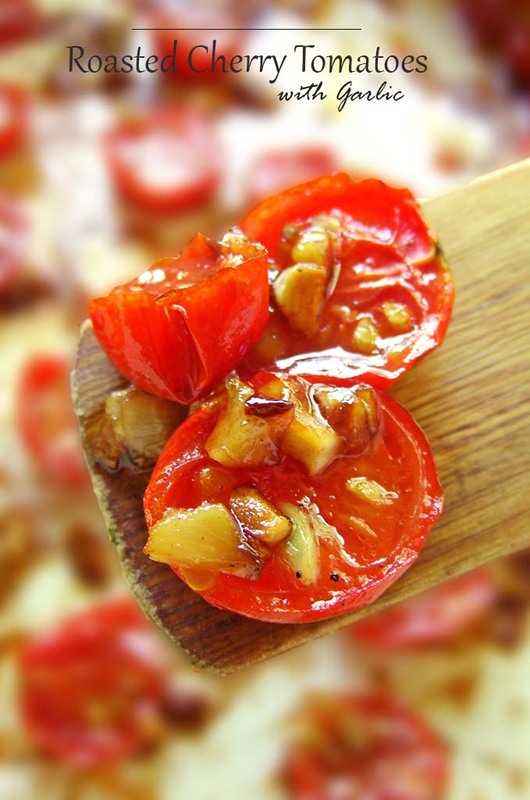 In a medium bowl, toss together tomatoes, garlic, olive oil, salt and pepper. Transfer to a baking sheet and spread into an even layer. 3. Bake until tomatoes burst and begin to caramelize, about 20-25 minutes. 4. Turn oven off and allow to cool for couple of minutes, and eat immediately standing over the sink with a kitchen fork…or on top of your favorite sandwich or even honey glazed chicken breasts.